The focus on our youth has been one of the priorities of the Rotary Club of Humber in Corner Brook where they have been instrumental in the establishment and continuation of the Rotaract Club at the Grenfell campus. Without money, our ability to “do good in the world” becomes challenging. The Rotary Club of Corner Brook holds a “Wine to Water” fundraiser which enables them to carry on their support of a school as well as water projects in Haiti. We have all read the story about the “Little engine that could”. The Rotary Club of Westville is a club that proved that they are “the little club that could”! They set out to build a splash park in their community and through the partnership with a variety of agencies saw their dream become a reality. Pizza Fest in New Glasgow is a must on everyone’s agenda in Pictou County! The members of the Rotary Club of New Glasgow host this incredibly successful event annually. Proceeds from this event enable them to give back to the community where they have constructed a gazebo in the Goodman Rotary park used by the residents for such activities as picnics and weddings! 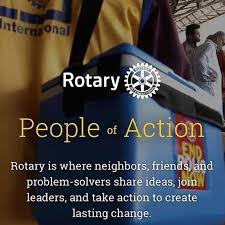 Please read the information on our District Home Page from Doug McMillan of the Rotary Club of Halifax. There are opportunities for clubs to assist with the Health Child Uganda project as was discussed in an earlier newsletter.